Happy Thanksgiving...with a Christmas card? Sorry...it's all I have to show. lol I wasn't going to even post this one as I am a bit embarrassed about it, but my FMS teammate Jen Timko told me it was cute. I'm curious to hear what you think? 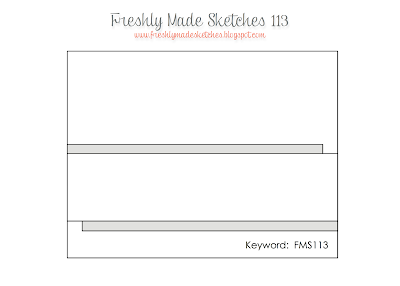 I almost sat out this week at Freshly Made Sketches because I didn't want to post this one. Thankfully I had time to make another card that I did like better. I keep looking at this one, but I don't like any better now than I did on Tuesday. I have some news to share today to make up for that awful card. 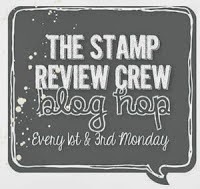 I was asked to be part of the Stamp Review Crew! 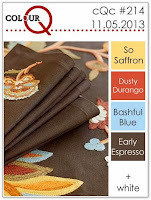 It is going to be a fabulous blog hop that will give you lots of ideas as we are featuring one set each hop. Our first hop is Monday, so be sure to tune in for that! Jason has to work early in the morning, so we put up the tree yesterday instead of tonight. I hate breaking our tradition, but I want him to be able to rest after cooking today. Laila is very fascinated with the tree and likes to tell us what all the ornaments are. I haven't used much of the Winter Frost paper that I have, so I needed to change that. I really love the colors. Blue and silver are my favorite colors for Christmas cards. I used Pool Party, Island Indigo, and the silver glimmer paper. Fun combo, right?! Laila had her picture with Santa today. 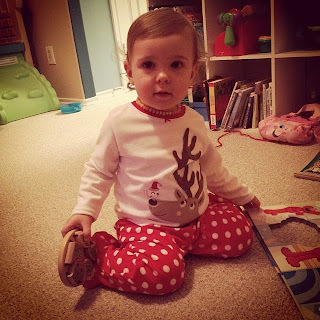 She got to wear her new Christmas pajamas and everything! 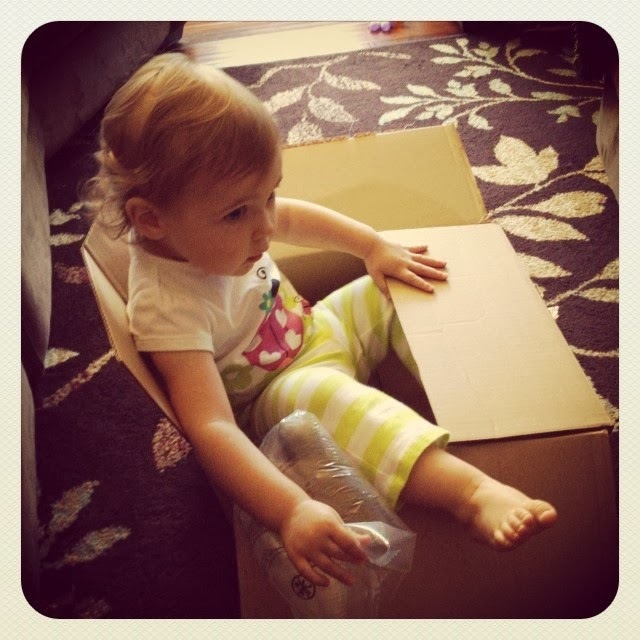 :) I was worried about how she'd do and Jason really thought she'd freak out. I've been working with her and she "knows" Santa from books and pictures and can say his name and "Ho Ho Ho", so I was hoping we'd be okay. Well, she was awesome! She sat in his lap and was so calm. She talked to him and even gave him hugs! It was adorable. I can't wait to get our proofs back. 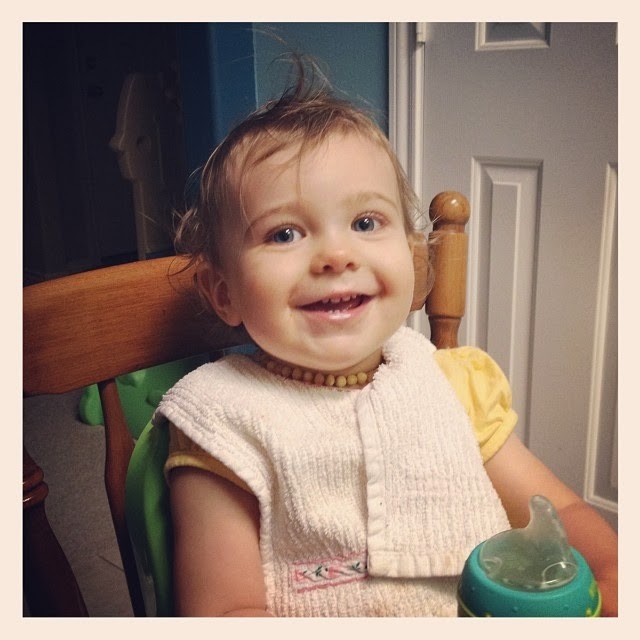 She's been teething again and these teeth seem to be so painful. 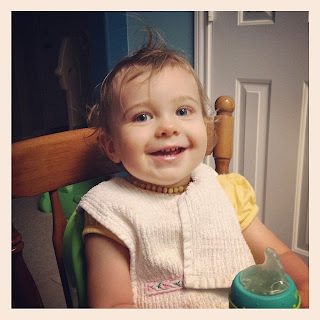 She's had a rough week, which means mommy had a rough week too. I was so worn out that I actually napped during her naps instead of stamping. Fingers crossed we are through the worst part of it! 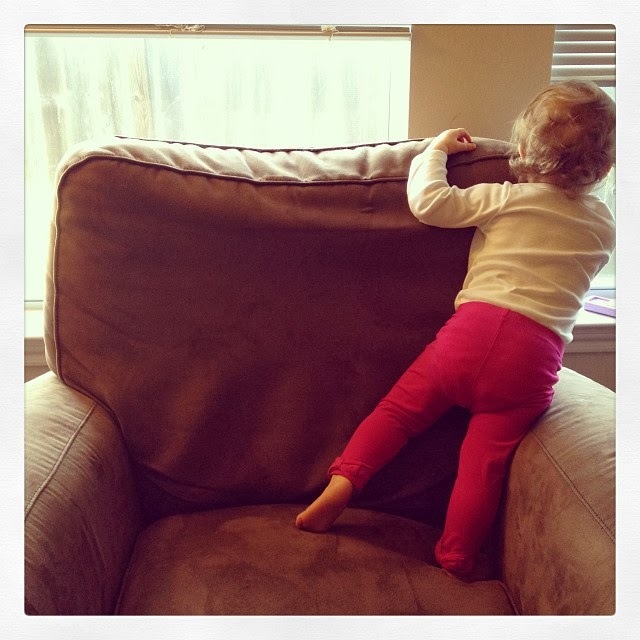 She's a whopping 17 months old today! Crazy. Miss Laila is napping so after I grabbed a quick shower, I headed to my room to stamp. :) Yay! I decided to tackle this week's Mojo Monday sketch. It's a fun one for sure. I used a lot of the supplies that were still on my desk from yesterday's card, so it's another strange Christmas color scheme. I love my square framelits for these kind of cards. They make it so much easier! Man. It's been a rough week here. I don't think I slept much Thursday or Friday nights and was so worn out. I have been trying to sleep every time Laila naps so that means NO stamping. 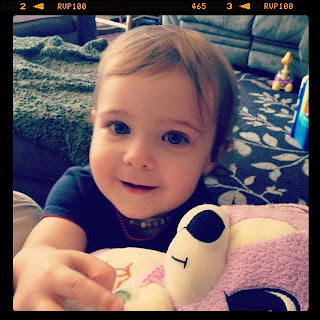 :-/ Thankfully the diaper rash that's kept us up is almost all healed and I slept great last night and took a nap today! That means I was able to stamp some today. I decided to play along with CAS(E) this Sketch and Dynamic Duos. 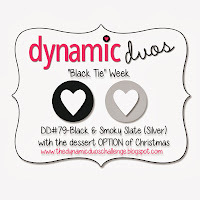 I wasn't sure about black and gray for a Christmas cared, but I figured I'd give it a shot. I think it turned out so elegant! I love it. 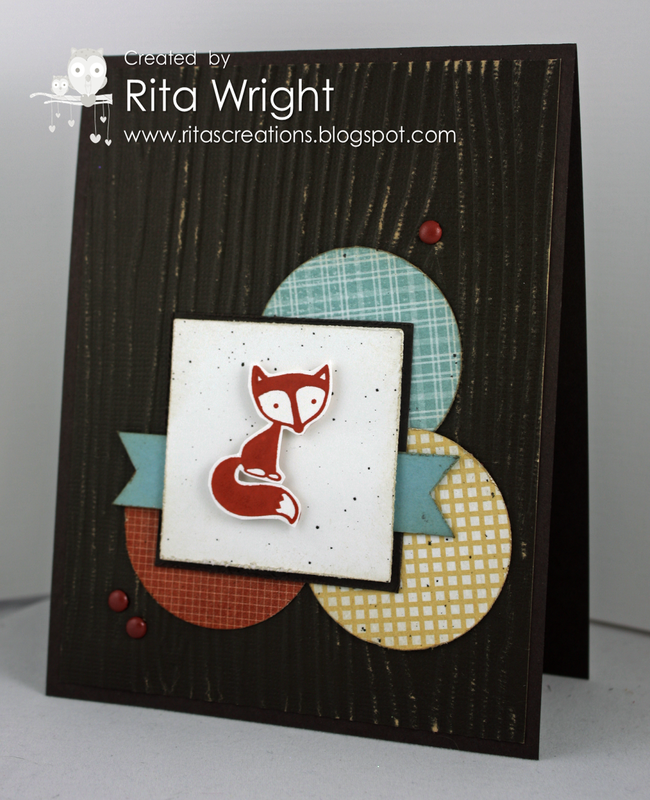 I had originally intended to use a tree image, so I embossed the black in the woodgrain folder. I hope it doesn't look bad with the ornament. I still liked it and left it. 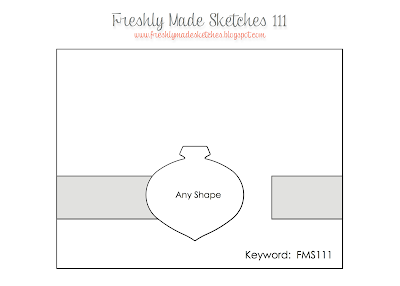 It's a new week at Freshly Made Sketches! 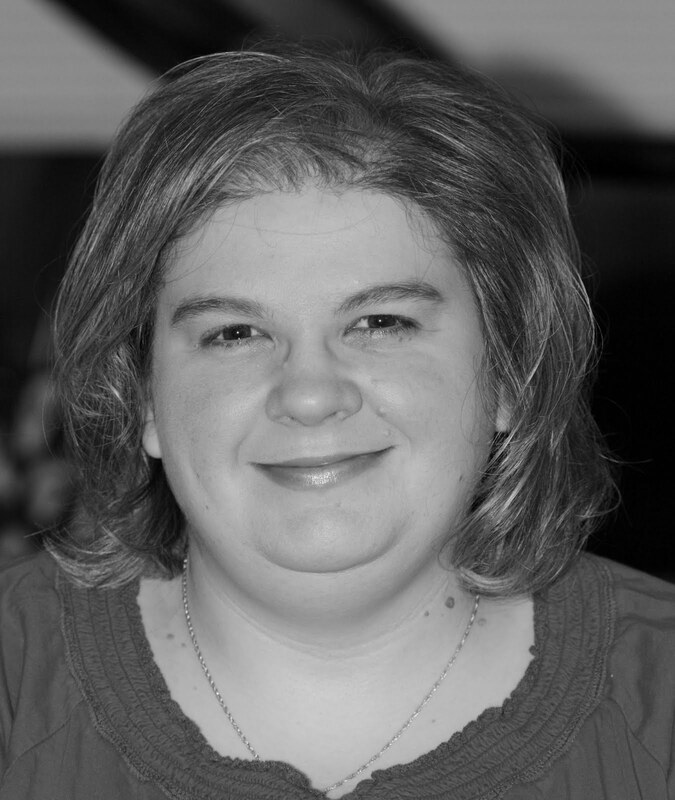 Jen B, who is seriously HILARIOUS, is our sketch designer and hostess this week. 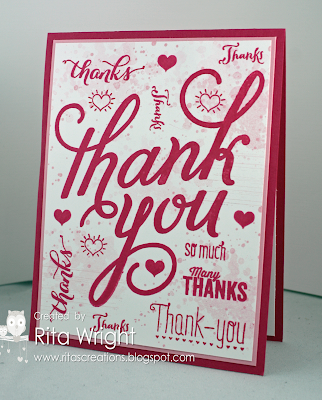 I admit to being a bit perplexed by her sketch when I saw it, but I really enjoyed working with it when I sat down to make my card. I think the entire design team rocked it out this week! Be sure you go by the blog and check them out. Okay, here's my sharing of my addiction. We all have bad habits that we waste money on and mine is coffee...and stamps of course. I love Starbucks sooooooooooooo much. This time of year always makes me happy because a peppermint mocha in a red cup is just pure heaven. I try to be good because it ain't a cheap addiction, but man! Thankfully Santa always brings me a gift card or two and my friends also get me gift cards for my birthday. :) So anyway, all that inspired this project we are making for club! 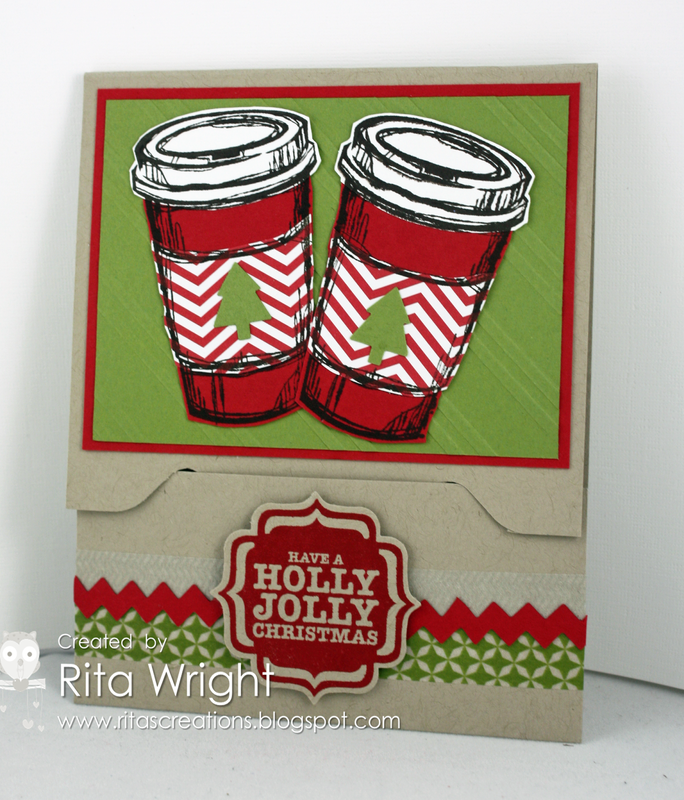 I used the Perfect Blend stamp set to make cute red cups for the holidays! 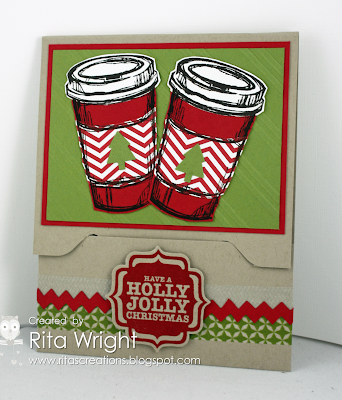 This is a cool gift card holder that I learned to make by watching the amazing Jackie Topa's video. 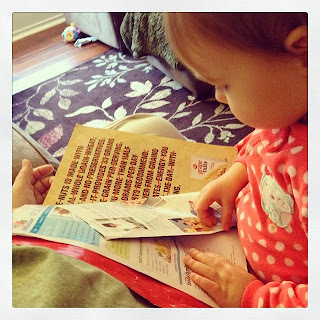 That envelope punch board does some cool stuff, right?! All it needs is a gift card in that little holder. I hope my club ladies like it! I've been working on a swatchbook in My Digital Studio for Laila's first year and it's so crazy to look back at how small she was just a year ago. This picture was from November of last year. Crazy! She's just growing too fast. Today I wanted to share one of the projects we are making at my stamp club on Sunday. 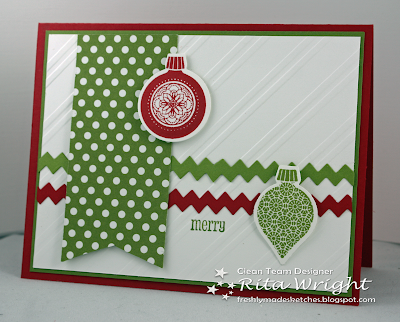 I decided to focus on Christmas and the Envelope Punch Board for this month. I love these file folder cards and had to make one! 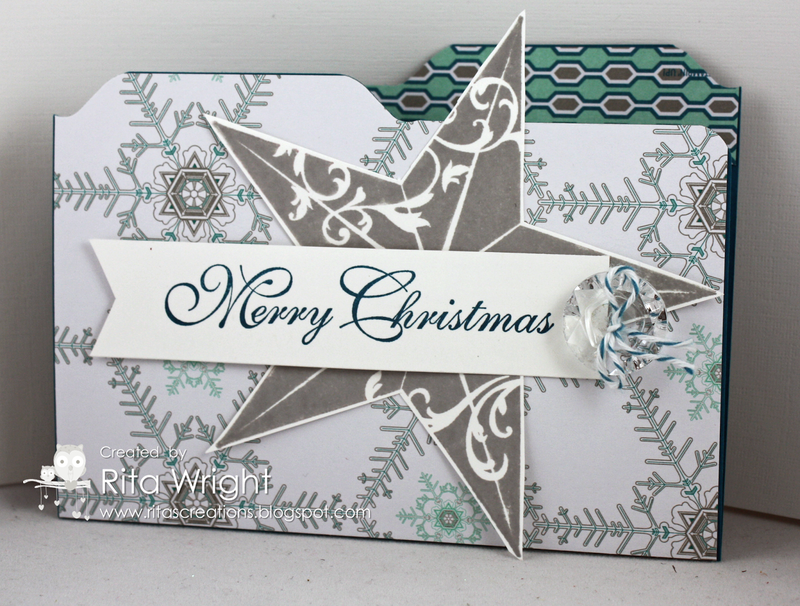 I used the gorgeous Christmas Star single stamp. You can find it and the other single stamps in my online store under the stamp category. 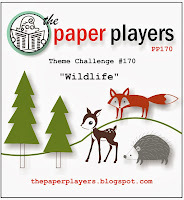 Isn't that designer paper gorgeous? 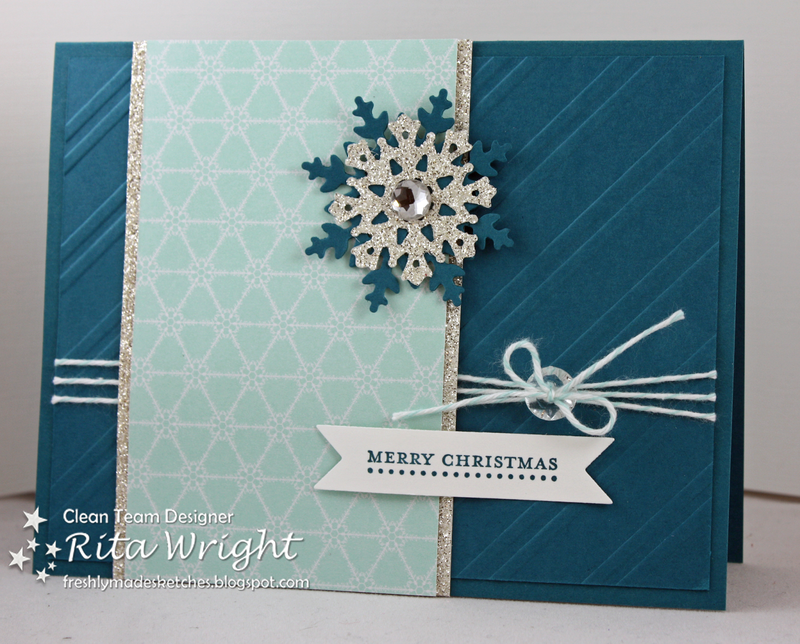 It is called Winter Frost and I just love it! Once she mastered the ottoman, she moved on to bigger (and more dangerous) things. Yikes! We are working on sitting in the chair so that mommy doesn't have a heart attack. I did flip it because it wasn't looking so great turned the other way. I think I need a larger heart to make that work. Whew. I'm tired and still have to get my club projects ready for this weekend. Stamp, stamp, stamp! I might have to take a week off soon just to clean up my room and give my shoulder and arm a break. Believe it or not, I finally finished all the HYCCT challenges today! I'm just so happy to have met my goal. It seems impossible with two club meetings, a design team, and a toddler but I did it. I'll be posting the last one tomorrow for Freshly Made Sketches, but here are the others that I've finished over the past few days. 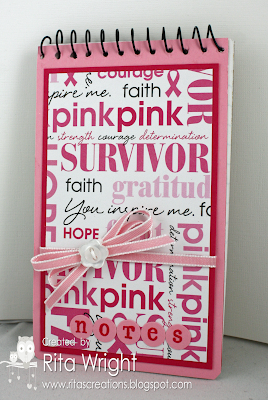 Sheri's challenge was to make/cover a notebook or note pad. 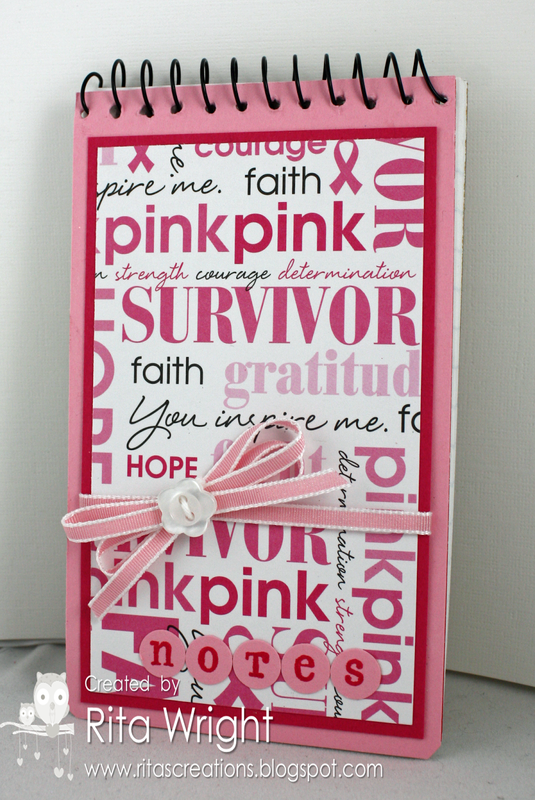 As a former nurse she knows how important it is to write things down, so these notebooks are perfect for that. I kept mine simple, but it's pink and ready to go! 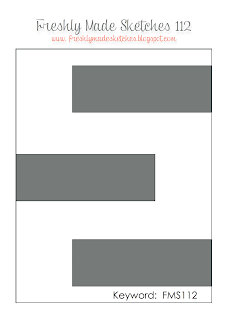 Edna's challenge was to make a card that could be from or to a group. I struggled with this one, but I thought my group of birds saying thank you could be from a group. They all have their hearts out in thanks, right?! ;) I need a stamp of a bunch of bananas! The final challenge was from Lydia and it was to make a black and white card with a splash of color. I cheated I guess with my mat, but hopefully she'll forgive me. I had been wanting to use the Fight like a Girl sentiment but hadn't been able to make it work before. 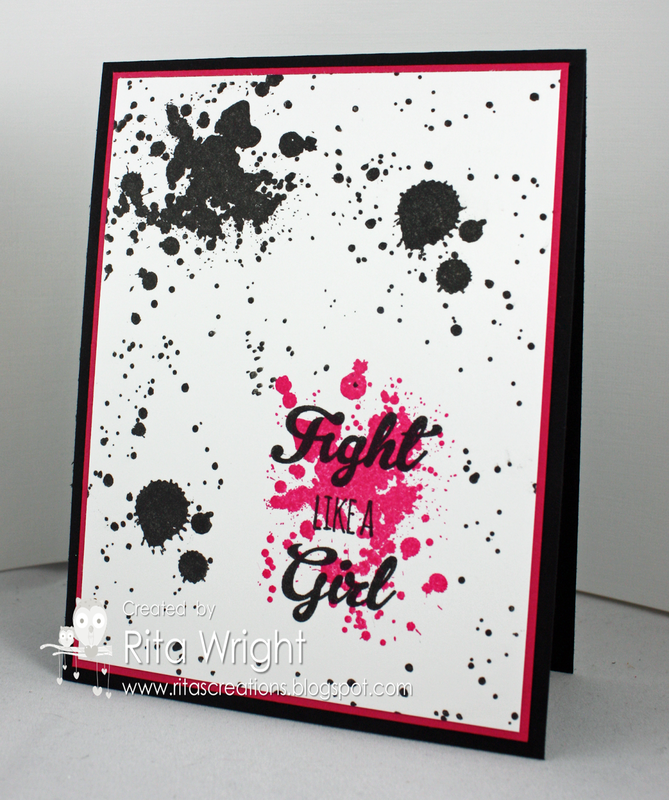 It seemed perfect for this splattered card! What a week! I am so worn out, but I've been trying to stamp when I can. I don't think I am going to meet my goal of doing all 36 of the HYCCT challenges, but I haven't given up just yet. I wanted to share two more of them with you today. This one is for Lisa's mixed media challenge. I've never really done mixed media that I know of, but I tried it here. There's a lot going on with the background, but it doesn't show up so well in the picture. 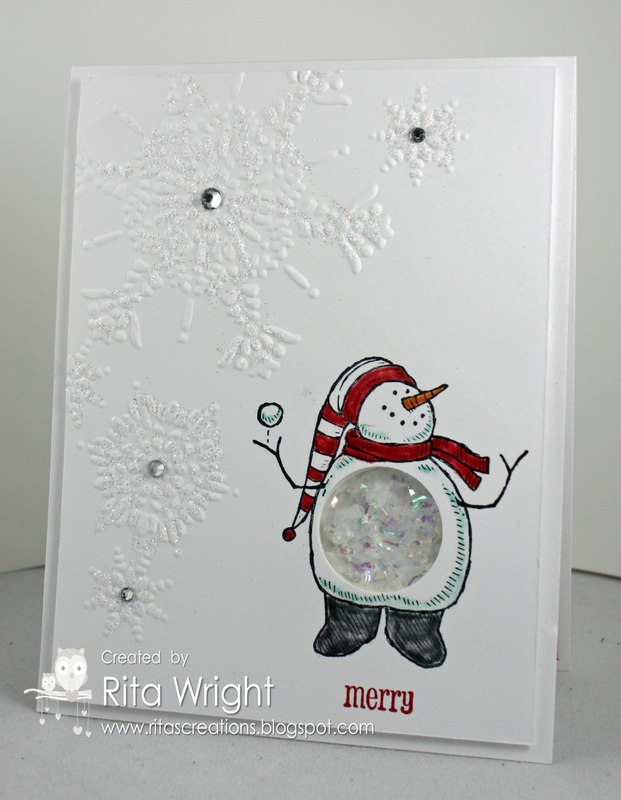 It has gesso, glittered acrylic paint, stamping, and some clear embossing. I added some of those adorable felt flowers that I hoard and added a simple sentiment.